We now have a mailing list of people looking for this flat monkey. 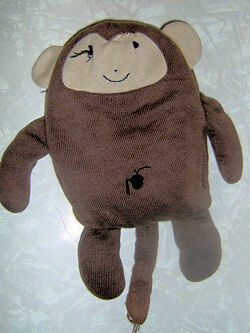 I’m looking for a little plush, flat square monkey from Old Navy’s from their Spring, 2006, baby monkey line. He’s kinda of a sock monkey of very soft t-shirt type material, about 9 inches, and brown with tan face and thread features. My 7-year-old son has this monkey. He is falling apart… both Monkey and my son. My son wailed (a gut-wrenching, primal kind of grief cry) for nearly an hour last night as he discovered the rip getting a bit bigger. He feels like he’s losing a loved one. I am very sad for him. We have Monkey wrapped up in a soft t-shirt like a baby bundle for right one. I have not been able to find another one. Anywhere. Monkey is special! Thank you and yes, I am still looking for one. However, I think $75 is a little steep for something that was originally $5 and 3 of them have fallen apart. If the seller will take less I’d buy it. Are either of you the seller? Sorry I am not the seller. Just happened to find it. Unfortunately some of the harder to find older plush also brings higher prices. With a mailing list hoped someone could benefit or at least keep watch in case of sale or make offer options. I am searching for the same monkey, so if you find more please let me know as the one on ebay has been sold. The last monkey like this sold on ebay for only $36, and the seller was an awful person to deal with, very dishonest, hiked up prices in her own listing and tried to get more. I don’t think this is same seller but I highly suggest you do NOT pay this ridiculous amount. We are having one made. These types of sellers are taking advantage of parents. This monkey was $5 to start with and falls apart very easily. Yes, my daughter still LOVES him and her 3rd one is falling apart but really, is it worth $129?? Get someone to make you one. ebay# 390497884495 with a make offer option. Good luck to all.